Hello May days!! My, how quickly the days seem to fly by! I swear, I think my brain is still stuck in March so April was just a blur. With only two months left of school, life is just going to get even more crazy. There are so many school events coming up and a few of them require parental involvement, like parent appreciation day and the art show (which I may have volunteered to help out with). I'm also starting to think about trying to come up with/sort out summer plans for the Kiddo since activities fill up so quickly, and on top of it all I've got my own stuff to do and plan for. ➳ This past weekend I barely touched my knitting. I accomplished maybe a full round on one of my Breathing Spaces, if that. I got caught up in chatting, blowing bubbles, and getting my hands dirty putting together our balcony "garden". ➳ Even though I haven't been knitting much lately, I like to think I made a lot of progress on both Breathing Spaces. On the first, I'm just a few twisted ribbing rounds away from binding off on the body (yay!! ); and on the second I'm over an inch into the main colour solid border on the hem. I'm keeping my fingers crossed that the sleeves will knit up quickly. ➳ I've been feeling under the weather the past few weeks (ok, fine. It's another sinus infection) and so my energy levels haven't been all that great. By the time the Kiddo's bedtime arrives I'm feeling pretty zapped myself. Normally I'm never too anything (re: tired, sick, grumpy) to knit, but not this time. Sinus headaches have been making me crap to hang out with. It's also another reason why I haven't been picking up my knitting needles. ➳ Last month Gudrun Johnston released a gorgeous cardigan pattern, Islay. 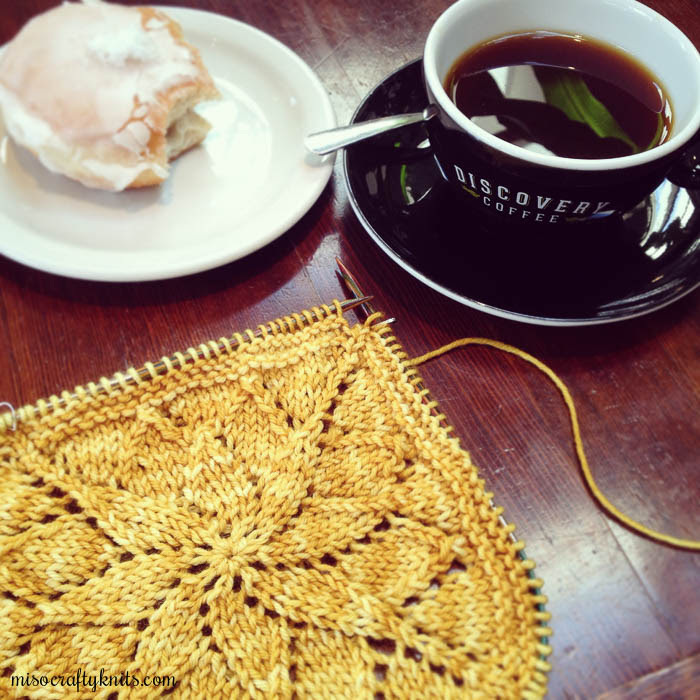 Since spotting it I've left the Ravelry page up on my browser, wishing I had more time/energy/hands to knit it up. 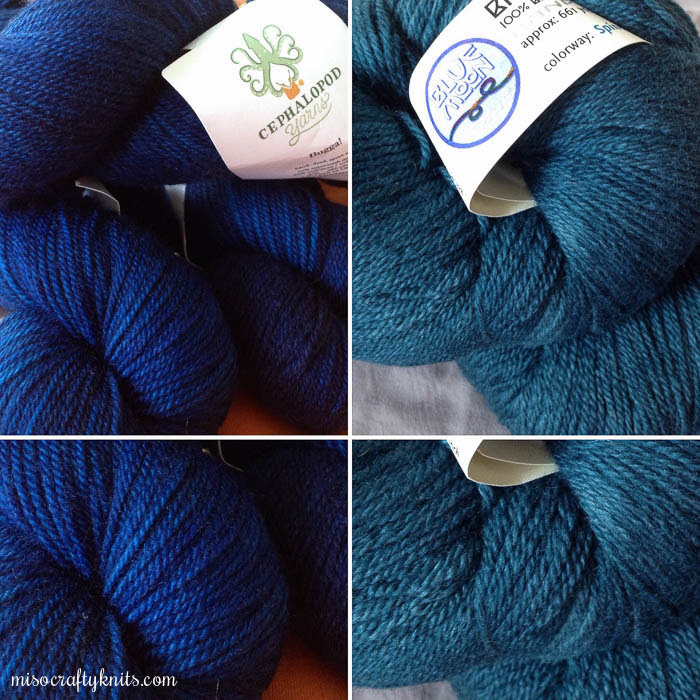 Well...turns out that Gudrun is running a KAL for Islay, starting this Friday (May 6th). My rubber arm was twisted and so I decided to join in on the fun and signed up. I've got until July 1st to finish the cardigan, that is, if I want to win the grand prize. The grand prize isn't what motivated me to join the KAL. I just needed a reason to cast on a new project. If you're interested too, find out the KAL details here. ➳ I went stash diving cause I just know I have yarn in my stash to knit up Islay. Lo and behold, I do. But I'm having a hard time deciding which to go with: the vibrant Charaxes Tiridate in Bugga by Cephalopod Yarns or Spinel in BFL by Blue Moon Fiber Arts (which is showing as more blue in the photo when really it's more of a lighter blue-green teal). Thoughts? ➳ I took a peek at my stash spreadsheet the other day. Yikes! I guess I'll be going cold sheep for the next few months. We're almost halfway through the year and I've only knit up a little over 2300 metres (2580 yards) and brought almost 4500 metres (5000 yards) back into the stash!! There's still a few skeins not accounted for but that doesn't help. I need to get this stash back under control! ➳ To help get the stash back into the minus and to get projects off the needles, I'm thinking of signing up for Stash Dash, hosted by The Knit Girllls. It starts at the end of the month and goes to about mid-August. Their rules are pretty relax (current WIPs count!) and there's no pressure - except for the kind that you put on yourself. I haven't decided if I'm going to sign up for the 3k, 5k, or the 7k yet as it all depends on how my hands are doing. Although, I think the 7k might be too ambitious and the 3k too easy. I guess I'm leaning towards the 5k is what I'm saying. And to make it easy for you, 5k is 5000 metres or 5468 yards. ➳ To soothe myself of my crappy hand dilemma, I've been indulging in some tasty treats. Last week I made a few jars of Pear Amaretto Sauce from the The Canning Kitchen cook book by Amy Bronee of Family Feedbag. O...M...G. This is sauce is seriously amazing!! I took Amy's advice and topped on a scoop of vanilla ice cream with the sauce. I'm officially addicted. Luckily for my tastebuds, horrible for my waistline, my community grocery store was having a BOGO sale on ice cream. So you bet I stocked up on some more ice cream!! This weekend I plan on making little cheesecake in jars just for this sauce. That's how much I love it. If you can find yourself a copy of the cookbook, I HIGHLY recommend this recipe! I can't wait for pears to go on sale again! ➳ Me-Made-May has started. I generally wear something I've handmade daily, whether it be a knitted item or something I've sewn. I'm not officially participating (taking so many selfies make me feel really awkward) but I do like seeing what others have made and how they've styled their pieces. My goal is to sew a few dresses for the summer since I currently don't like anything in the shops, MMM just might be the perfect motivator to get that going. ➳ The #CratfyBlissChallenge wrapped up on Sunday. I really loved this round and have found not only a few new people to follow on Instagram, but added to my list of books to read and patterns to my queue. I loved seeing where people were located (from the Skyscape prompt) and seeing how people interpreted so many of the prompts, especially Reflection. I've been going over the hashtag feed trying to come up with some favourite photos for my recap, but it's so hard to only pick a handful! Wow. That was a lot for the first few days of May! I can only imagine what the rest of the month will be like! Do you have any plans for May? I like the teal for Islay!